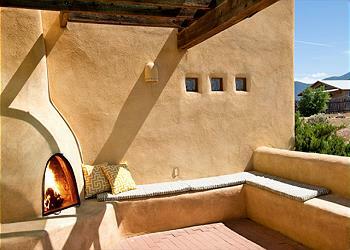 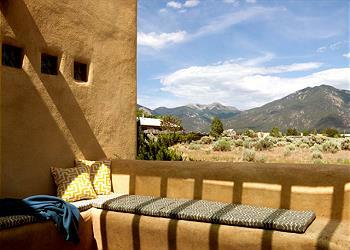 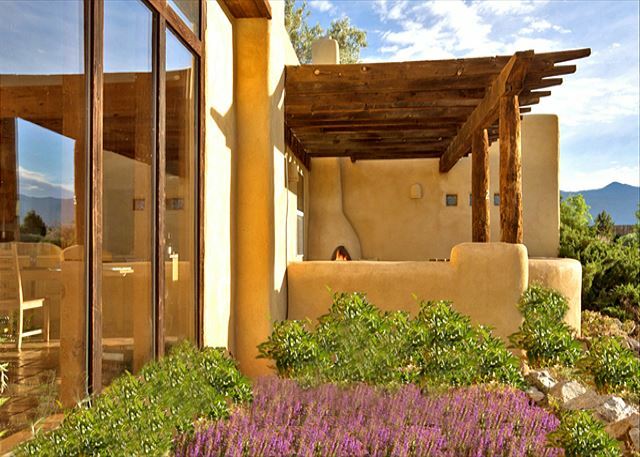 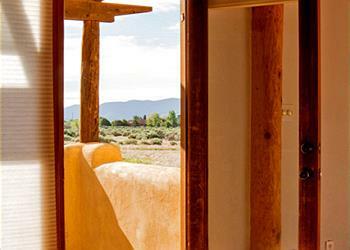 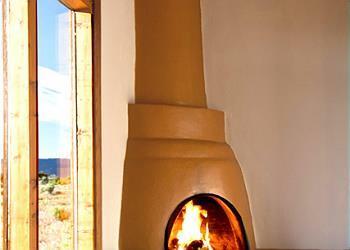 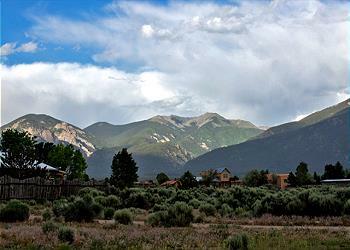 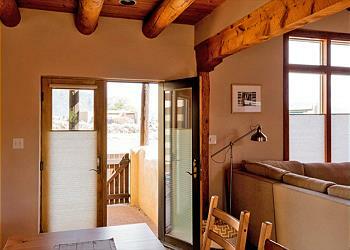 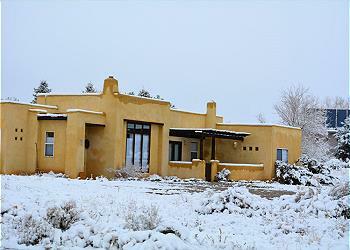 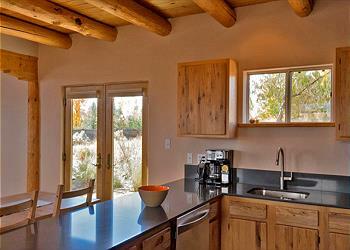 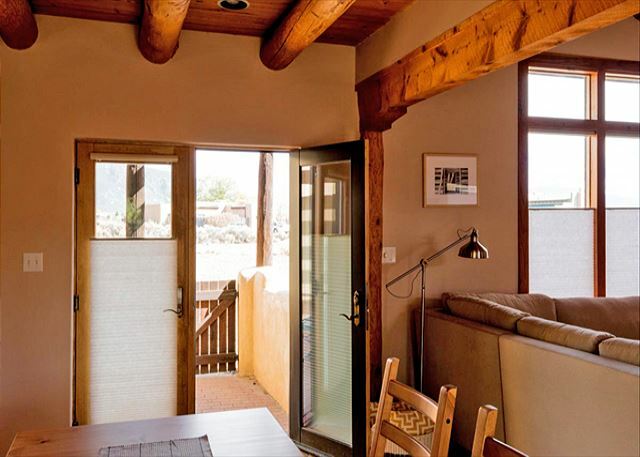 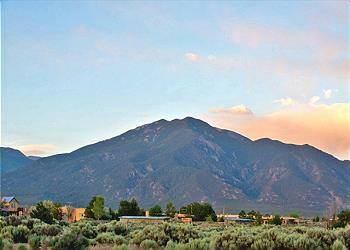 Buena Vista is a comfortable two bedroom home set within the sweeping landscape of Taos Mesa. 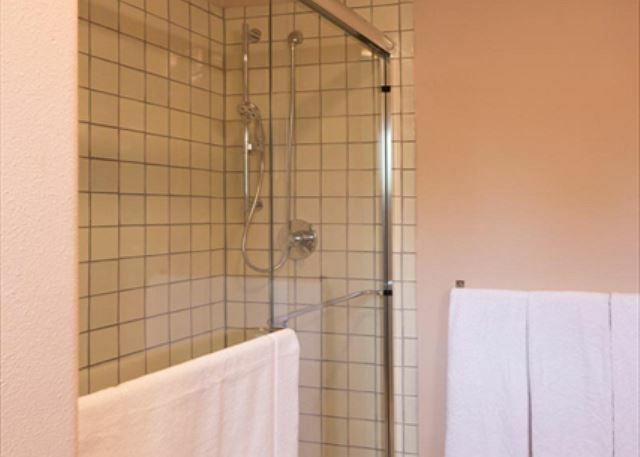 Recently renovated, the home is equipped with modern amenities and furnished with care. 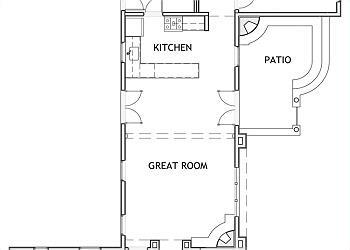 The two well-appointed bedrooms are located at opposite ends of this one story house, so there's plenty of privacy. 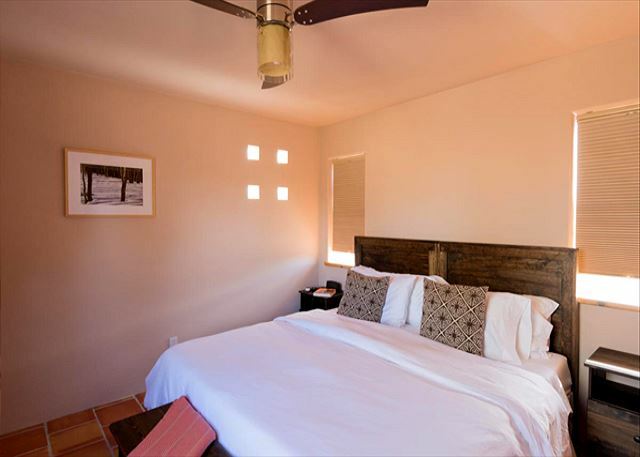 You may prefer the large front bedroom with the sunrise mountain view, king sized bed, and convenient access to the hall bathroom with generous tiled shower, or you may favor the cozy back bedroom with en suite bathroom. 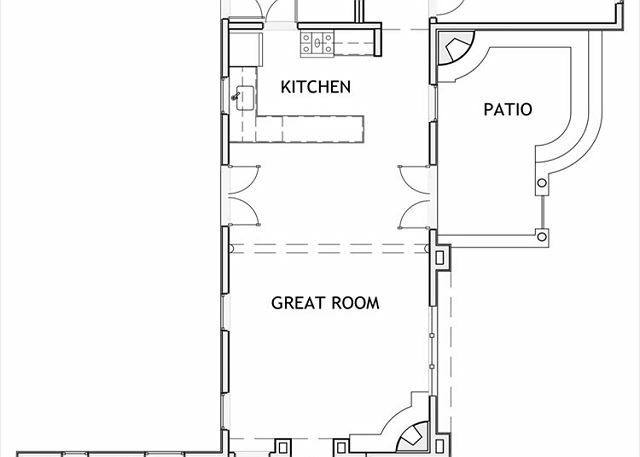 Make sure to let us know if you'd prefer the back bedroom made up with one king sized bed or two extra-long twin beds. Either way, luxuriate in the fine hotel quality linens. 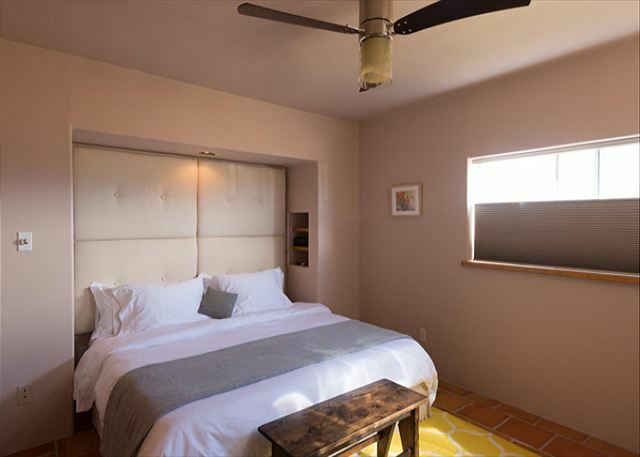 To ensure a restful night's sleep, both bedrooms are furnished with Tempurpedic Cloud mattresses and, for year-round comfort, the rooms are equipped with large ceiling fans with exceptionally quiet DC motors and feature heated Saltillo tile floors. 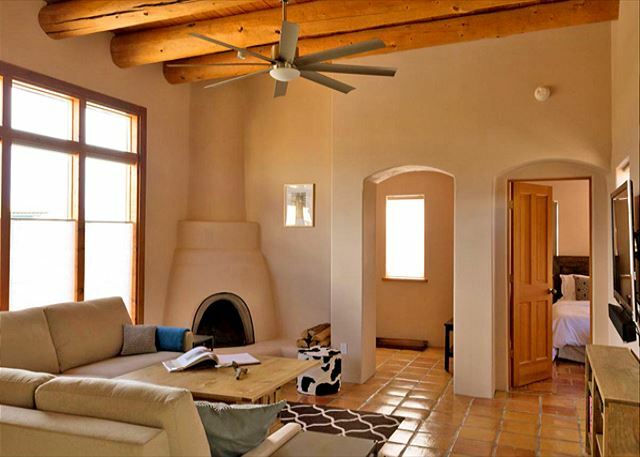 At the center of the home, the Great Room provides plenty of space for gathering under the traditional viga ceiling, and plenty of windows to take in that stunning view. 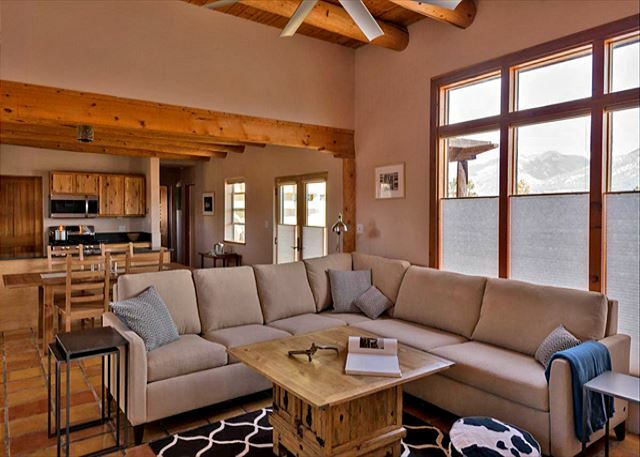 Sink into the American Leather Comfort Sleeper sectional sofa for an evening of fireside reading, or pull the shades and take advantage of the up-to-date media equipment. Three flat screen TVs are connected to satellite service; one in each bedroom and a large screen with blu ray player in the Great Room. 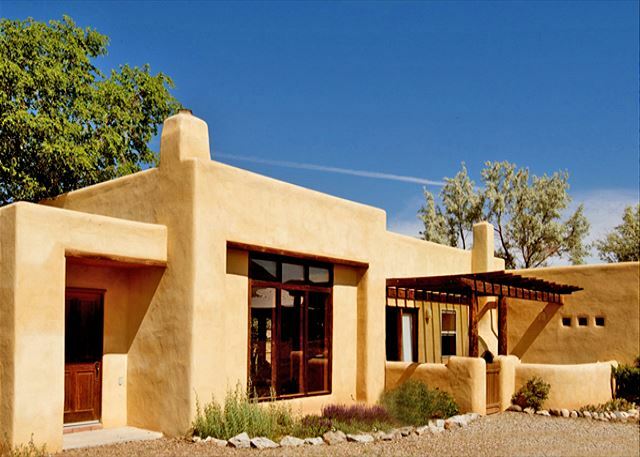 Stream your favorite playlist over the Bluetooth enabled sound bar or cast from your own entertainment accounts via the Chromecast. 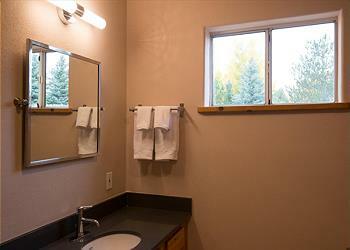 For your convenience, wireless high speed Internet and USB charging stations are provided. 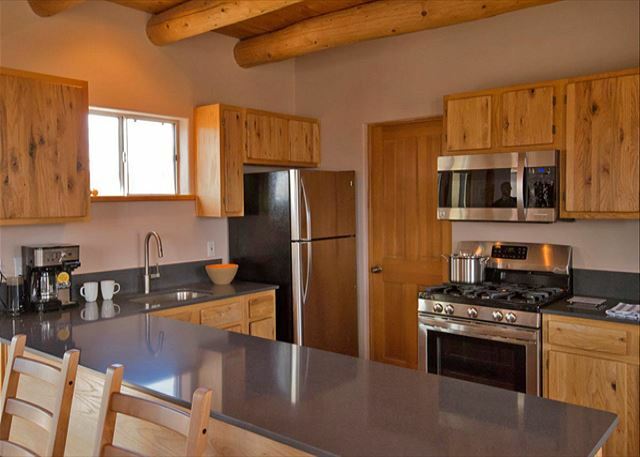 Open to the Great Room, the updated kitchen is fully equipped with a convection microwave, gas range, refrigerator with ice maker and ultra-quiet dishwasher, as well as an array of small appliances, utensils and pantry staples. 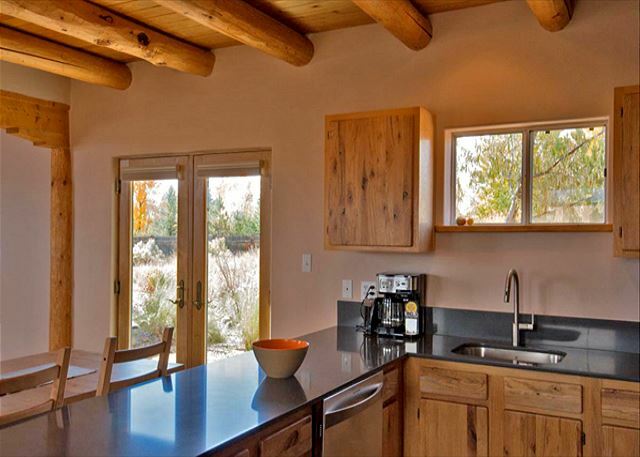 The kitchen contains plenty of dinnerware for a group to share a meal at the generously sized dining room table, whether it be home cooked (Why not try your hand at making a batch of New Mexico red chile?) 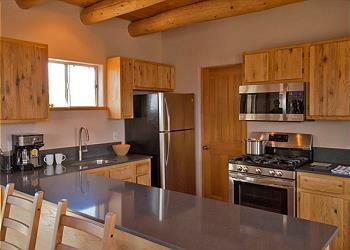 or conveniently brought in from the local market. 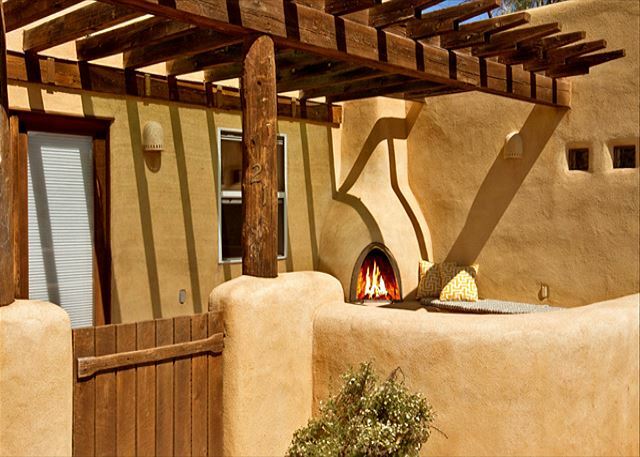 For alfresco cooking in the back garden, open the patio doors wide, roll out a cart of refreshments, and fire up the gas grill. 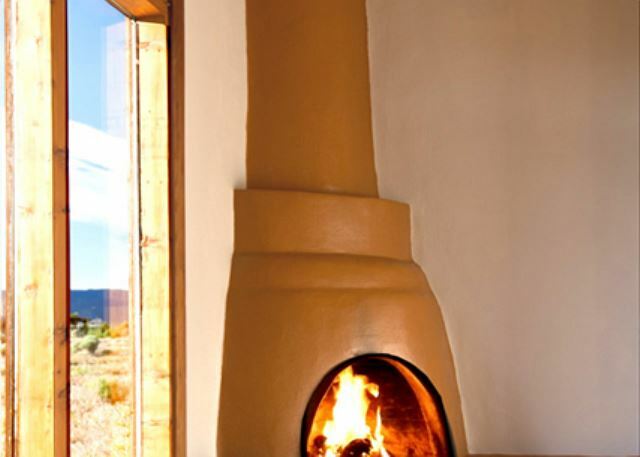 Later, when the sun gets low in the sky, grab a blanket and cozy up next to the outdoor kiva fireplace to admire the evening light illuminating the slopes of Taos mountain. When it's time to head out to see the sights, you'll find this quiet, naturally-landscaped neighborhood is a convenient jumping off point for excursions to the Rio Grande Gorge, Enchanted Circle and Taos Ski Valley, but yet, is still only five miles from Taos Plaza.